Dr. Alan Merten’s retirement after sixteen years as president of George Mason University was not a shock to the institution, but rather like an inevitable graduation. By announcing his retirement in March of 2011, Merten gave the University a chance to adjust and to prepare for the change in leadership and possibly a change in direction. Sally and Alan Merten’s last year at George Mason was full of celebrations, tears, and remembrances, culminating in a dinner for 700 guests at Patriot Center to celebrate both the Mertens’ service and the 40th Anniversary of Mason’s independence from the University of Virginia. The engines were already moving in the search for a new president in the summer of 2011, and the University Website even featured a page where one could follow some of the process. However, as is the case of most modern high-level job searches, the details were kept secret to protect the individuals being considered. Rumors of who was in the running for the position were rife all over the campus, as the names of well-known politicians and retired military leaders were among the many believed to be “in-play” by curious members of the Mason community. The guessing game reached a fever pitch when the Board of Visitors (BOV) called a press conference for the morning of December 15, 2011. Early that morning at the Mason Inn representatives of the regional print, television and radio media rubbed elbows with interested members of the campus community while awaiting the announcement. 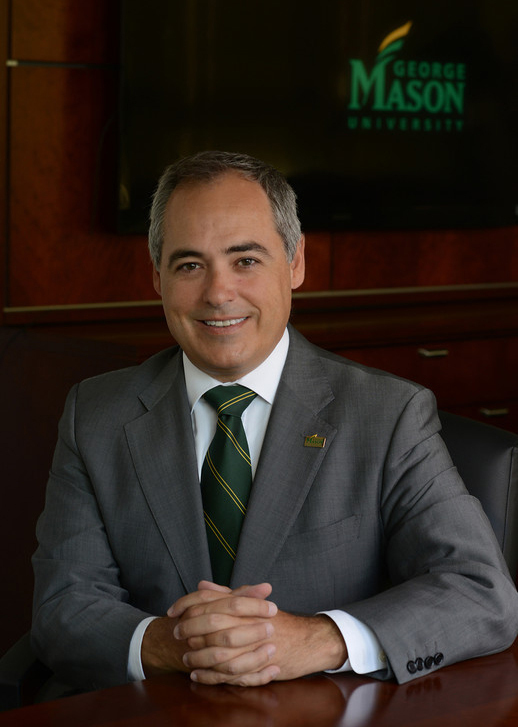 The Rector of the Board of Visitors, Dr. Ernst Volgenau, announced that the committee had recommended, and the BOV had unanimously approved Dr. Ángel Cabrera as the sixth president of George Mason University. Browse items related to the appointment of Dr. Ángel Cabrera. Alan Merten’s farewell letter of March 23, 2011, George Mason University Website, Accessed July 9, 2012, http://AlanMerten.gmu.edu . “40 Years of George Mason University: A Legacy of Leadership” George Mason University Alumni Association, Accessed July 9, 2012, http://alumni.gmu.edu/get-involved/Event%20Pages/40years.html. Daniel Walsh, “Board of Visitors Selects Dr. Angel Cabrera as Sixth President of George Mason University, Effective July 1, 2012,” George Mason University Newsdesk, Accessed July 10, 2012, http://newsdesk.gmu.edu/2011/12/board-of-visitors-selects-dr-angel-cabrera-as-the-sixth-president-of-george-mason-university-effective-july-1-2012/ . University Leadership, George Mason University Website, Accessed July 10, 2012, http://administration.gmu.edu/presidentscouncil/#cabrera. Dr. Ángel Cabrera, Electronic Mail Message to Faculty and Staff of George Mason University, July 2, 2012.